The president quickly shifted his focus to US Attorney General Jeff Sessions, declaring that Rosenstein was hired by the AG and that Trump had nothing to do with the deputy attorney general’s appointment, according to Fox News. The question was raised because Trump announced on January 31, 2017, that he would nominate Rosenstein to be the deputy attorney general. “I was not involved in that process because, you know, they go out and get their own deputies and the people that work in the department,” Trump said, cited by the Hill. The president’s remarks came a week after an interview in which Trump — perhaps decrying a lack of lockstep loyalty from the AG — asserted that he didn't have an attorney general, while declaring that he had chosen Sessions, a former Republican Senator for Alabama, out of an assurance that loyalty would be the most important job requirement. Sessions came under fire from Trump after the AG recused himself from overseeing the ongoing investigation into alleged Russian interference in the 2016 US presidential election – a probe now overseen by Rosenstein. 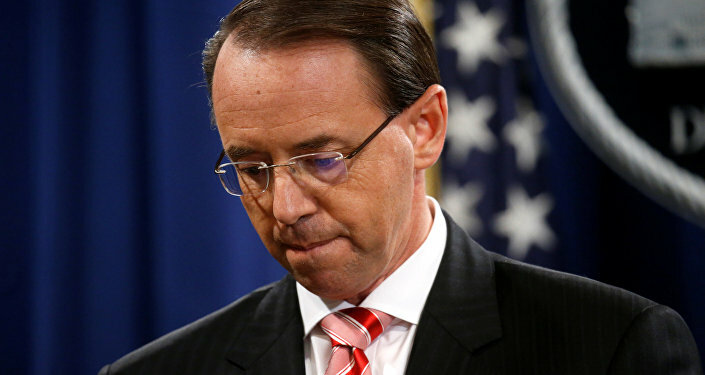 However, the deputy attorney general was recently criticized by Senator Lindsey Graham who suggested Rosenstein should appoint a special counsel to investigate FBI's actions, trying to "destroy the President", Sunday News reported. "If Rosenstein’s involved, he should be fired. If he’s not involved, leave him alone," Graham said. Trump referred to the Rosenstein allegations as “a very sad story” and has promised to “make a determination” about how to proceed. Rosenstein allegedly discussed secretly recording Trump while enlisting Cabinet members to invoke the 25th Amendment of the US Constitution to remove the president, according to a Friday New York Times article. Rosenstein denied that he ever suggested secretly recording the president, and according to a Fox News source, he made these comments with a "sarcastic" tone. According to Fox News, Rosenstein allegedly made his comment in May 2017, while meeting with temporary acting FBI Director Andrew McCabe, following Trump’s firing of agency head James Comey. McCabe was himself fired by Trump in March after an internal Justice Department investigation found that he lied about his involvement in a news media disclosure. Rosenstein called the Fox News report of his alleged suggestion to secretly record Trump “inaccurate and factually incorrect” adding “there is no basis to invoke the 25th Amendment” based on the deputy AG’s interactions with the current US president.